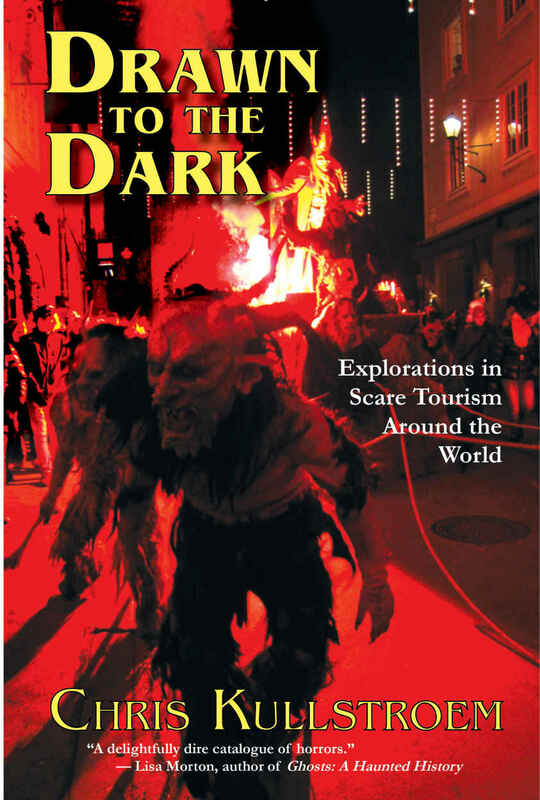 While there’s no shortage of Halloween movies, TV specials, and new music perfectly fitting for our favorite holiday arriving this season, if you’re looking for something creepy and cool to read this October, you should be sure to check out Chris Kullstroem’s amazing new book, Drawn to the Dark: Explorations in Scare Tourism Around the World. Inspired by a fascination with fear culture, Kullstroem left her job and New England home to travel for a year and experience firsthand some of the world’s most legendary scare shows, including Mexico’s Day of the Dead, the haunts of New Zealand, the mythical Krampus brought to life in the streets of Austria, and as well as the history of Dracula in Transylvania, demons of Japan, horror games of England, and much more. Eventually she brings the adventure back home where it all started for Halloween in America, but most of the other attractions are not based around the holiday itself, though similar themes can often be found. With guidance from the locals who live where these celebrations are held, each eerie enactment evokes a sense of wonder, demonstrating powerful emotions that transcend language and culture to reveal a connection we all share, because in the end, we all like to be scared. Drawn to the Dark goes the extra mile in exhibiting how our collective love of scary things goes far beyond the haunt industry as we know it in America and much deeper into the history of these countries. Kullstroem is a lifelong Halloween, horror, and dark tourism enthusiast. She holds seminars on how scare venues blend history, theater, and social interaction, while exploring what these shows can teach us about our society and the people around us. The book’s a fascinating read and the encounters Kullstroem has along her epic journey more than reaffirm that the Halloween lifestyle is alive and well on more than just one day a year for many like-minded people from all different parts of the planet. Her embedded investigations provide a fun point of view as readers travel with her and get an up close look at what makes these events more than just scare attractions, but proud celebrations of the cultures of these varying regions. This is travel journalism at its creepy best, as the author details her experiences with humor and heart, and plenty of colorful insight from the locals she meets along the way, and she essentially provides a map for a monster lover’s ultimate trip around the globe. The perfect companion for October or any time of year for those of us who celebrate Halloween every day, you can order your copy of Drawn to the Dark here.